Last week I completely forgot to actually link up my Muffin Tin Monday post with Muffin Tin Monday. Kind of funny. I've been running around doing last minute things before Pierce starts school later this week, so I've been kind of forgetful. I'm looking forward to getting back into a rhythm of school days though. 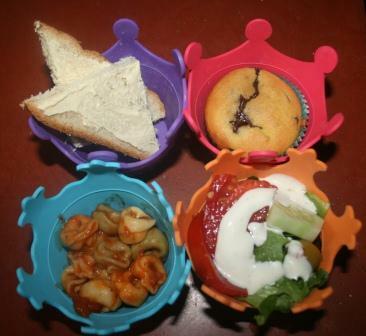 He had homemade bread with butter, cheese tortellini in a marinara sauce, salad (cucs and tomatoes from our garden) with ranch, and a fundamiddles cupcake (my mom brought over a couple of boxes of the mix that she'd found on clearance, so we had fun making them). He liked this dinner pretty well. Right now I feel like I am forgetting something, but I am not sure what it is. Hey that looks pretty darn good! Hope you had a great weekend! You, my friend, are not alone! The dinner looks so good! I bet he ate every bite,it looks yummy! Yes,I am missing many brain cells,it started last week,lol! Mmm tasty! Good luck to Pierce on his first day of school. Hailey starts next Tuesday for preschool. I'm sad but also excited for her. Another tasty (and cute!) meal! Yep, I hear you on feeling that the little grey cells aren't up to par. Seems like my usual remedy, coffee, is not working like usual. Livie started school last week and I start tomorrow, so it'll definitely be nice getting back into that good, ol' routine. LOL... been there done that on posts through the years. Life goes on and then we remember. Looks great Lisa--I am jealous. We are def missing a few brain cells. Two of the kids started school today and we are not back in that routine yet. Duh here for sure. I always feel hungry after I read your Muffin Tin posts . . . Yes, I am terribly forgetful, and I don't even have small children! I've forgotten what I need to remember not to forget today...no, you aren't the only one. I know what you mean-this time of year is crazy! Amy goes back two weeks from this Wednesday, but she has several meetings before then. Hi Lisa, You do so well ---keeping up with the things you have to do raising 3 young children. I'm proud of you!!!!!! Can't believe that Pierce starts school already... Times are flying--aren't they???? That meal looks delicious... I'd enjoy that one also!!!! Yes my brain is not working right. Since I'm a teacher I already have a lot on my mind, then Mica's birthday and school lists and such. You had the twin's birthdays; therefore you are in the same boat as me. I was filling out a school paper for Mica last week on the spot. It said, "Child's name". I put mine. Different things like that, I kept doing. Finally my husband said, "Hand it to me! I'll fill it out!" Those muffin tins are really cute! How fun to eat out of little containers. i'd eat that for dinner. I think I always feel this way! Cute muffin cups! My garden is just about gone. It got too hot, too soon...I hope my eggplant lasts! It's so refreshing, Lisa, to see how you serve nutritious foods to your family. Reid'a dinner looks very good. Just wait until you have to get all 3 ready to start the school year! haha, it must be the sun!! can't be our age!! oh wait, you are a youngin'!!! I go through phases like that where I can't keep it together for anything! That's a fun lunch. It's no wonder that he enjoyed it! What's not to love? That looks awesome! Especially the home made bread. I guess moms have the right to be a little forgetful. That is what my hubby is for to remember what I forget. Hope you have a great week. Those cupcakes ROCK! ;) Yummmmm. I've got lists going all over my house--yeah, you are not the only one losing their mind. It's a busy time of year--one kid starting her senior year of high school and the other leaving for his junior year in college. I'm not sure if I have less time or money these days. Ugh. So, yeah, you are not alone! I am always missing brain cells. A permanent fixture of motherhood! lol Love those crown cups. everyone of my kids would like that meal. school starts for us next Monday...i can't wait! of course i'm missing brain cells, but it isn't because school is starting again. it is just life!!! lol. Forgetful is for many ages. Cute meal... fit for royalty!